In offering municipal solid waste disposal services to the communities we operate in, we ensure that millions of tons of unwanted materials found in everyday household waste are used as fuel to create needed electric power, steam and heat. Wheelabrator pioneered waste-to-energy in the US in 1975. Today, we continue to generate clean baseload power from solid waste, creating local energy for our communities where local waste becomes fuel for local power. Our 16 waste-to-energy facilities in the US and the UK have an annual waste processing capacity of over 7.5 million tons, and a total combined electric generating capacity of 825 megawatts - enough energy to power more than 771,000 homes in addition to our own operations. Wheelabrator’s safe, clean solutions to solid-waste disposal are sustainable. We recover thermal energy as high-pressure steam, convert it to electrical energy or steam, which can be sold as its own renewable energy source for local communities. 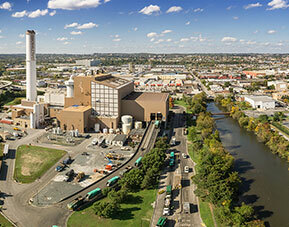 Our waste-to-energy facilities complement community recycling programs. Statistics compiled for more than two decades show that communities relying on waste-to-energy maintain, on average, a higher recycling rate than the EPA national average. Our systems augment communities' recycling efforts by extracting metals from trash that would otherwise be landfilled—further reducing the need to mine virgin materials for new products. For more information about how your community can take advantage of our solution, contact a member of our team at services@wtienergy.com.